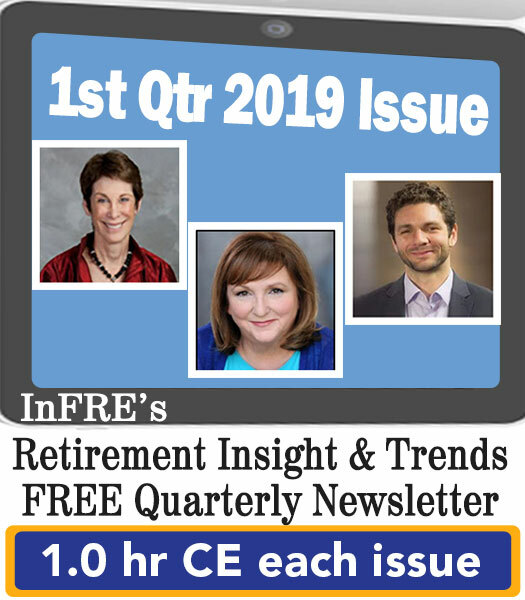 2019 1st Qtr Issue - Retirement puzzle, Hacking longevity, Three popular retirement income philosophies - Retirement InSight and TrendsRetirement InSight and Trends | Helping professionals with the practical application of new retirement readiness, counseling, planning and income management concepts for the mid-market. “The Couple’s Retirement Puzzle: Helping Couples Navigate Their Retirement Transition: Challenges and Opportunities” by Dorian Mintzer, M.S.W., Ph.D., BCC, CSA . One of the things that I like to share with advisers working with couples is to think about the concept of a puzzle. It’s both a noun and a verb. It’s not as if the puzzle pieces are going to fit together like a jigsaw puzzle. Think about your own life, think about some of the clients you had or have; there are just a lot of areas that impact each other, and it’s not going to fit together just like the jigsaw puzzle. “Hacking Longevity: How Three Generations Over 50 are Navigating Longer Lives “ by Lori Bitter, The Business of Aging. There are now three generations of adults over the age of 50 in the United States. The U.S. joins most of the developed nations of the world in increasing life expectancy. According to the Pew Research Center, the world’s centenarian population (those living to age 100) is projected to grow eightfold, from approximately a half a million people in 2015 to 3.7 million in 2050. “Through the Looking Glass: Three Popular Retirement Income Philosophies” by Jamie Hopkins Esq., LLM, CFP®, ChFC®, CLU®, RICP. Can we build systems and processes that really encourage the client, the end consumer, have a more secure retirement and overcome the hurdles we know exist because of misconceptions and fear from biases? 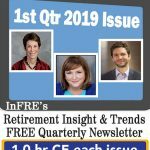 The articles below comprise the 2019 1st Qtr Issue of Retirement Insight and Trends. Click on the links below to read each article online separately, or click here to view and print the issue in its entirety. One of the things that I like to share with advisers working with couples is to think about the concept of a puzzle. It’s both a noun and a verb. It’s not as if the puzzle pieces are going to fit together like a jigsaw puzzle. Think about your own life, think about some of the clients you had or have; there are just a lot of areas that impact each other, and it’s not going to fit together just like the jigsaw puzzle. 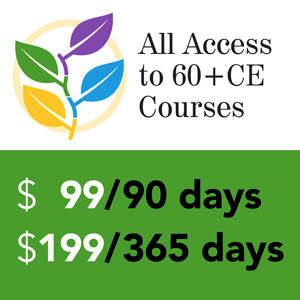 My belief is that finances and health and wellness are two of the most significant and most important of the puzzle pieces because they really do impact the kind of choices that we have – lifestyle options, where we live, how we’ll be able to take care of our self if there are medical issues that come up. The puzzle is unique to each person, each couple. There are now three generations of adults over the age of 50 in the United States. The U.S. joins most of the developed nations of the world in increasing life expectancy. According to the Pew Research Center, the world’s centenarian population (those living to age 100) is projected to grow eightfold, from approximately a half a million people in 2015 to 3.7 million in 2050. 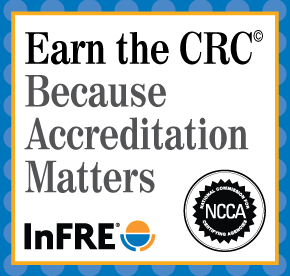 If we are a comprehensive advisor, there are situations where we can make smart decisions for clients, whether we’re converting assets, helping them securing long-term care, or helping them with net unrealized appreciation (NUA) strategies when they have employer stock inside their retirement plan.